Our road safety and traffic law expert Alta Swanepoel was requested to provide clarification on the situation concerning public roads and the possible intervention of traffic officers at the weighbridges operated by the mines. The National Road Traffic Act, 1996 (NRTA) regulates what is considered a public road for operational purposes. The issue of whether a motor vehicle is used on a public road is relevant for the law enforcement of most offences that can be committed with a motor vehicle, including the overloading of a motor vehicle. It is therefore important to understand what constitutes a public road for purposes of the legislation. The definitions of public road and operate on a public road applies. The definition of a public road is not linked to the “ownership” or maintenance of a road, parking area, etc. but to the common use or right of use by the public of a road. It should not be confused with a private road for maintenance purposes. A road may be considered “private” for purposes of road maintenance legislation (SANRAL Act and Provincial Road Acts or Ordinances, but if it is used by the public, it is considered a public road for purposes of the NRTA. 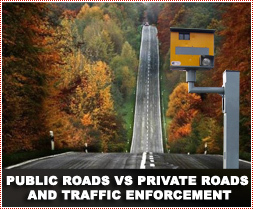 The various Acts have different definitions as to what is considered a public and what a private road as the purpose of the legislation is different. Section 69 of the NRTA is also important, as it creates a presumption that every offence in terms of the NRTA is committed on a public road if it is stipulated as such in the charge sheet. Where in any prosecution in terms of this Act it is alleged that an offence was committed on a public road, the road concerned shall, in the absence of evidence to the contrary, be presumed to be a public road. Where in any prosecution in terms of this Act it is alleged that an offence was committed on a freeway, the road concerned shall, in the absence of evidence to the contrary, be deemed to be a freeway. Where in any prosecution in terms of this Act it is alleged that an offence was committed on a public road in an urban area, the road concerned shall, in the absence of evidence to the contrary, be presumed to be a public road in an urban area. A person, who wants to argue that a road is private, to avoid prosecution or prohibit a traffic officer from enforcing the law on such road, would, therefore, have to prove that a road has access control or members of the public do not use such road. This is generally difficult to prove. In terms of decided cases, very few roads are considered private. In a specific case, even the fact that a mine displayed a sign stating that a road is private and prohibiting the public from using it was not sufficient to regard the road as private, due to the fact that the mine did nothing to ensure the road was not used by the public. As all the roads that are going to be affected by the move of the R555 weighbridge, will carry vehicles from different operators and will allow access to the public, it should not prove a problem to do law enforcement on the mine roads.